Charming air-conditioned apartment with uncovered private parking located 10 minutes walk from the city of Carcassonne (World Heritage) and 15 minutes from downtown. 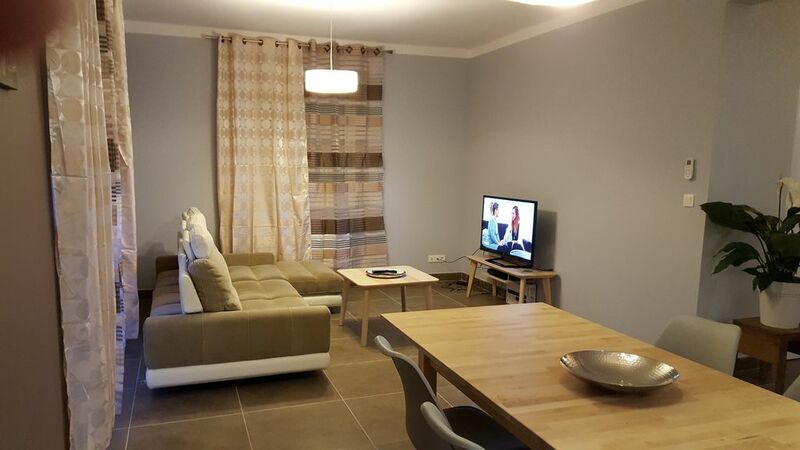 Our apartment of 90 m2, completely renovated in March 2017, can accommodate 5 people, it is composed of a large living room with flat screen and free WIFI open on a kitchen, 3 bedrooms (bedroom 1: double bed 160X200, bedroom 2: 2 twin beds 90x200 and room 3: 1 bed 90x190), a bathroom and separate toilet. All equipment and bedding are new. The apartment is located on the 1st floor of a detached house with a separate entrance and closed individual parking. In the living room you will find a corner sofa, a dining table and a flat screen, the kitchen is fully equipped with hob, oven, microwave, fridge, coffee maker, toaster, dishwasher, washing machine, cooking utensils and dishes. Bath and bed linen is available on site.